This article is based on the vyAkyAna avathArikai (introduction to the commentary) blessed by mAmunigaL for nAyanAr's rahasya grantham named AchArya hrudhayam. 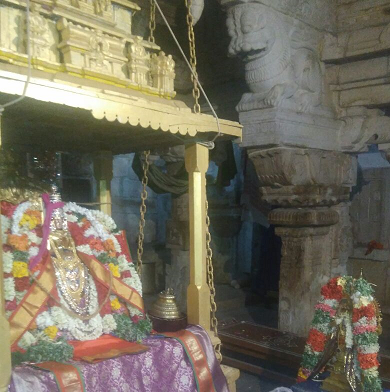 sarvESvaran who is the divine consort of SrI mahAlakshmi and is the lord of all, is accepting the eternal services rendered by nithyasUris in SrIvaikuNtam (paramapadham, spiritual realm) which is filled with unlimited bliss. nithyasUris are those who have unlimited pure knowledge, bliss etc; they act according to the divine will of emperumAn and sustain themselves with that. While accepting their services, emperumAn thinks about the bound souls who are in material realm, who are also equally qualified to render services but are not doing it, grieves for them and desires to uplift them. He is constantly engaged in many efforts to uplift them. Seeing the chEthanas (sentient beings) remaining without body and senses (during creation) similar to achEthanas (insentient objects), thereby unable to engage in enjoyment in this world or to attain liberation, out of overwhelming mercy, he bestowed them body and senses which are useful for them to attain his divine lotus feet and gave them knowledge and the ability to act and restrain. Out of great mercy, he bestows vEdham so that the chEthanas can use the knowledge and identify what is to be pursued and what is to be given up. Further, being the antharyAmi (in-dwelling super soul) of manu and sages, he mercifully reveals smruthi, ithihAsas and purANas. These SAsthrams exist for the sake of AthmAs who are with bodies. Since there are lots of restrictions to learn these SAsthrams, and since they are learned after trying for long time, considering in his divine heart that they are difficult to attain, he revealed the brahma vidhyA named ashtAksharam which is solely focussed on the salvation of AthmA. Seeing that this also did not help in fulfilling his desire [of uplifting all], just like the kings who would themselves step out to help when their message does not accomplish what is required, he himself descended as SrI rAma, krishNa et al., to uplift them. Seeing that no one got uplifted even after his efforts, thinking that his being different species (paramAthmA different from jIvAthmAs) and thinking that he cannot reform them, as those who catch deer would use another deer to do it, he decides to help the jIvAthmAs through other jIvAthmAs. He started mercifully glancing everywhere to create the best person, and as no one was becoming a target of his glance, in the southern direction, his glance befell upon nammAzhwAr who was a bound soul who was suffering through birth and death cycle continuously, and as a result of that merciful glance and emperumAn's causeless mercy, he attained divine knowledge and devotion. 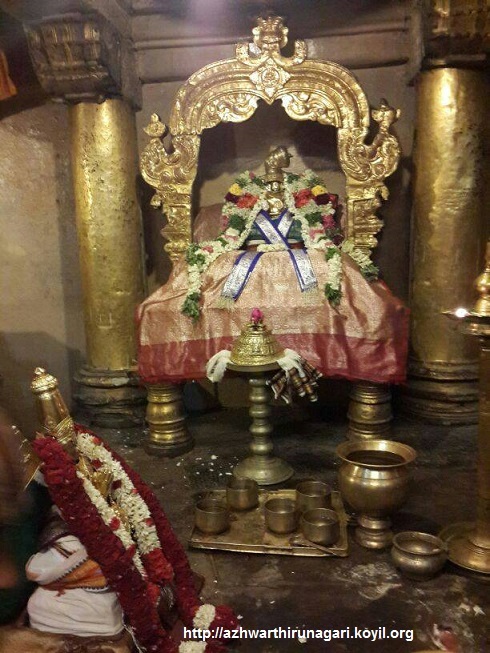 AzhwAr deeply enjoyed emperumAn's svarUpam (true nature), rUpa (forms), guNa (qualities). 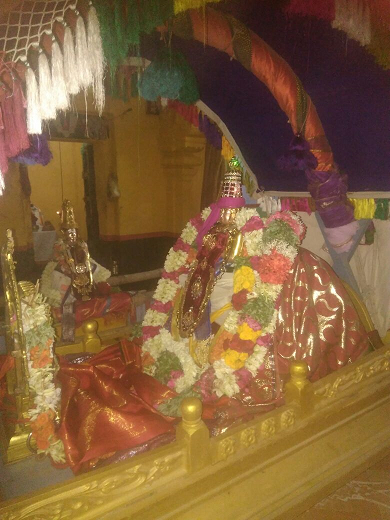 vibhUthi (wealth, activities) and as an outcome of such experience, mercifully composed the pAsurams. Just as the SlOkam which was recited by vAlmIki out of sorrow, lead to SrI rAmAyaNam which was perfect per poetic rules, by the grace of brahmA, AzhwAr's pAsurams became thiruvAimozhi which is perfect per poetic rules, by the grace of bhagavAn. Note: Through these pAsurams, all chEthanas got the means for their upliftment. 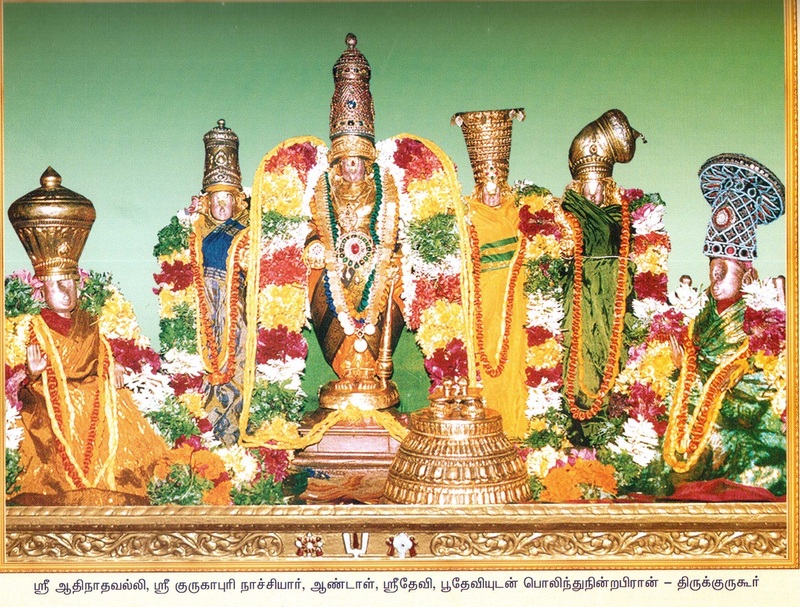 As this thiruvAimozhi is in thamizh, being vast and revealing many principles, since it is difficult for everyone to understand the essence in it, azhagiya maNavALap perumAL nAyanAr, out of his great mercy, thinking about revealing the special meanings in it, the divine will of AzhwAr in it and the subject matter which is desirable for our AchAryas is the refuge for all, mercifully explains these principles which were orally taught by AchAryas thus far, in this prabandham named AchArya hrudhayam which is aptly sized (neither too small nor too big). This prabandham is divinely named "AchArya hrudhayam" since it reveals the principles which are dear to the divine heart of AzhwAr who is the first AchArya of the followers of vEdham as said in "Adhyasya na: kulapathE:", as he explained in his dhivya prabandhams. nAyanAr mercifully used the words from dhivya prabandham to construct this prabandham. The reason for this is - as AzhwArs were divinely blessed by bhagavAn with divine knowledge and devotion, their words are most trustworthy and enjoyable, they are dear to him too.Further, as a necklace strung by an expert in pearls will be very expensive, these words which were collected from dhivya prabandham and compiled by nAyanAr with his ability to do so, the text itself will be sweet for those who are interested in dhivya prabandham. Thus, this prabandham will be very relishable for those who are scholars due to the quality of the words and their meanings.